The most useful wiki for physicians, this SwitchWiki. 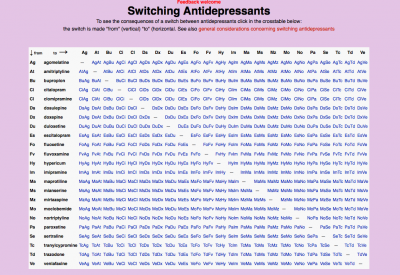 In this wiki you can find detailed information about switching from one antidepressant to the other, the same for antipsychotics and how to combine mood stabilizers. You can also calculate the conversion from a benzodiazepine to diazepam equivalents. Both for the antidepressants and anti psychotics switch tables are made. Clicking on the appropriate switch continues to an explanation and switch schedule with links to Medscape, Pubmed, PubChem, Wikipedia and several other websites for more information. The benzodiazepines calculator can help you switch from one to another benzodiazepine. This SwitchWiki is made by Walter Broekema. He is one of the editors of Psychiatrynet.eu. You can read more about the background of this SwitchWiki here. Feedback is very welcome. Depressed patients often do not respond to there first antidepressant or have to quit the antidepressant due to side effects. Switching to another antidepressant is often a solution. Nevertheless switching from one to the other depressant can be difficult. How do you switch, which taper scheme and which built up scheme do you use. How is this influenced by the cytochrome P450 system? 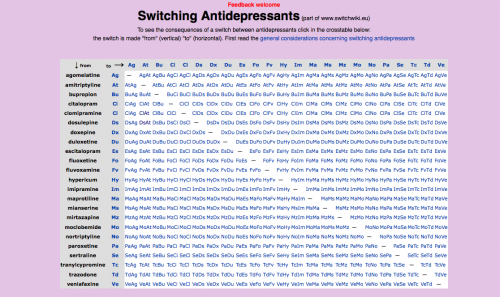 Since recent there’s a table on a website with most, if not all possible switches from one to the other antidepressant: www.switchingantidepressants.eu. It’s a Wiki made by Drs. Walter Broekema, a pharmacist in a large psychiatric hospital in The Netherlands and Dr. P.N. van Harten, a psychiatrist and chief editor of the Dutch and Flemish Journal of Psychiatry and www.psychiatrynet.eu. This site was recently discussed on this blog. Each switching scheme is accompanied with links to Medscape, PubChem, and Wikipedia for more information. 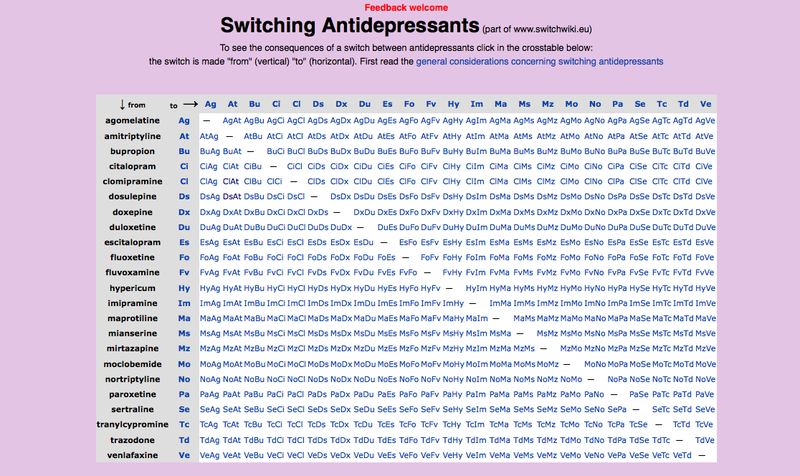 There’s also a table for switching from one to the other antipsychotic on: www.switchingantipsychotics.eu. In a recent published research 44,218 and 46,089 baseline users of single typical and atypical drugs, respectively, and 186,600 matched nonusers of antipsychotic drugs were retrospectively compared for the risk of sudden cardiac death. Current users of typical and of atypical antipsychotic drugs had a similar, dose-related increased risk of sudden cardiac death. It was already known that typical antipsychotics increased the risk of sudden cardiac death. This study adds the important knowledge that atypical antipsychotics also carriages that risk increasing with higher dosages. How high is the risk? Current users of typical antipsychotic drugs had an adjusted rate of sudden cardiac death that was twice that for nonusers. 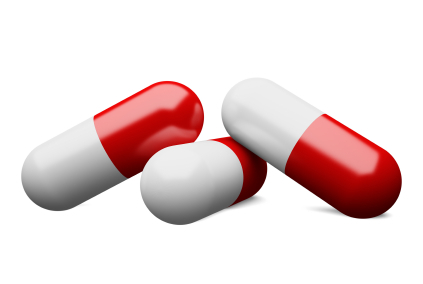 A similar increased risk was seen for current users of atypical antipsychotic drugs. The 6 atypical antipsychotics did not differ significantly. Before you think that atypical antipsychotics are a safer alternative to typical antipsychotic, think twice. When prescribing or taking off label atypical antipsychotics think twice. Especially children and elderly with dementia. Does this mean we can’t prescribe antipsychotics? No but before you doe be sure to do it for patients with a clear indication. Physicians should continue to be able to prescribe antipsychotic drugs when there is clear evidence of benefit, for conditions such as schizophrenia and bipolar disorders. 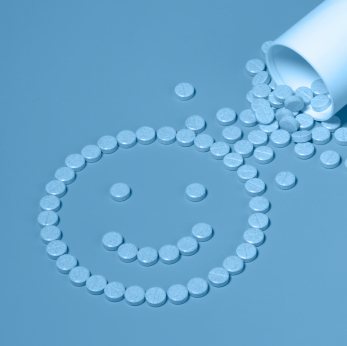 Should it change the way we prescribe antipsychotics? One of the arguments for this recommendation is that clozapine’s risk on agranulocytosis is smaller than this adverse effect while those patients are tested frequently with close monitoring of white cell counts during the first months of treatment. This is a small book fits in your pocket nicely. It is written for medical students, junior doctors and general practitioners. It starts with a clear and concise introduction in psycho pharmacology. It explains pharmacokinetic and pharmacodynamic principles. Next drugs are discussed in the main categories of psychopharmacological drugs: antipsychotics, mood-stabilisers, tricyclic antidepressants, mono amine oxydase inhibitors, selective serotonin re uptake inhibitors, other antidepressants and a chapter for other drugs used in psychiatry such as benzodiazepines, drugs for Alzheimer disease, drugs used in substance dependence.